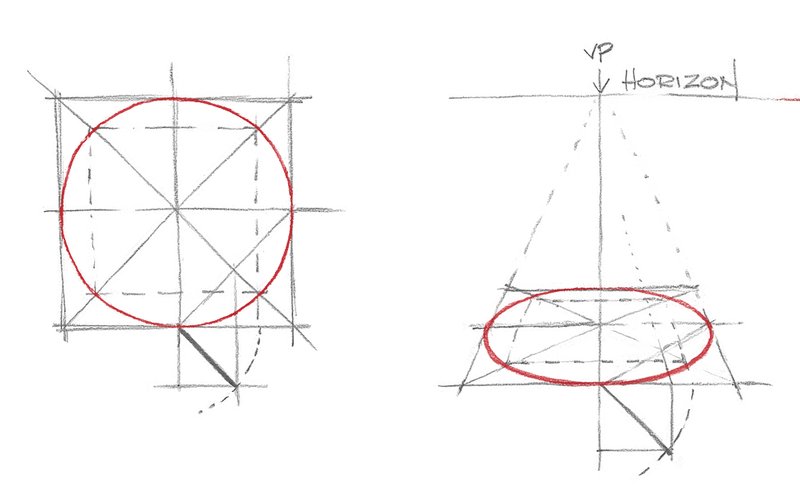 Someone sent me to youtube the other day where I found myself sidebarred by a tutorial on circles in perspective. Clicking on that I found a Ton-O-Tutorials all of which I watched had one thing in common: none of them revealed the trick that I'm about to show you. If I wind up dead in an alley in the next few days, you'll know why. The following is freehand. No T-squares, triangles, rulers, compasses, calibers, guides, etc were harmed in this production. Why? The day WILL come when: Your computer fries, the TSA seizes your drafting kit, you're scribbling on a napkin to impress a client at lunch, fill in the blank... here's your escape plan. We know that a circle will fit inside a square and be tangent to the square at four points. Those being the mid-points of each side. Question: Where will the circle cross the diagonals of the square? Answer: At a point determined by the diagonal of a Measuring Square. Draw your square. Bisect diagonally to locate the mid-point. Bisect horizontally and vertically. Diagonally bisect (blue) the lower right square. From that mid-point to the vertical bisection is 1/4 the squares baseline. Project that distance to the baseline. From the measuring diagonal's edge, project up. Where that line hits the diagonals of our first square, project horizontally. Adding the last vertical is optional but, if you did, you'd have a second square inside the first. The corners of this new square mark the points where a circle will cross the diagonals. … Dude, I coulda' just traced my beer can. Why, yes, you could, Jeeves, and you'd be right but, here's where the magic starts. For the circle in perspective, "Second verse, same as the first." Everything is the same EXCEPT we do it in perspective UNTIL we draw the Measuring Square THEN we go back to perspective. To be clear: the Measuring Square is NOT subject to perspective, it remains geometrically square.